When Are Key Limes Ripe? Key limes, also known as Mexican limes, are small citrus fruits best known for their use in making key lime pie. 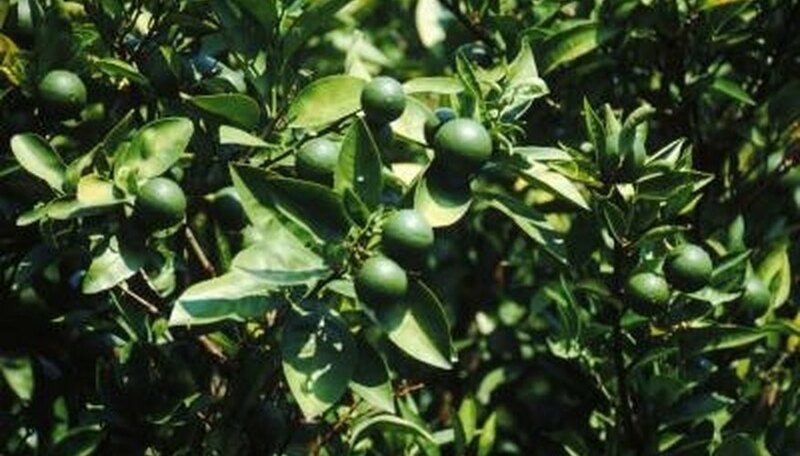 A key lime's characteristic tart flavor will be most prominent when the lime is ripe. Key limes are ripe when their rind is yellow. According to Texas A&M University, the lime will be juicy and flavorful if it is picked when the rind is yellow. This is in contrast to Tahiti or Persian limes, which are commonly sold in grocery stores and are best while their rind is still slightly green. Because key lime trees are tropical plants, they can produce a harvest year round. However, the biggest harvest of key limes typically occurs during the summer, especially in climates in the United States where winter temperatures are significantly lower than summer temperatures. Key limes for commercial sale are often picked when they are light green rather than yellow. The lime continues lightening in color for a couple weeks after it is picked, so this practice helps the limes to have a longer shelf life. The two main types of lime trees are the Mexican lime (Key lime) and the Tahiti (Persian or Bearss) lime. The lime tree is a short bushy plant that is smaller than an orange or grapefruit tree. It is an evergreen tree. The height of a lime tree ranges from 6 to 13 feet. The Tahiti lime tree can grow to 20 feet. Lime trees are susceptible to cold weather and cannot survive in areas that freeze, if left unprotected. The best climate for lime trees is damp, warm conditions that provide plenty of rainfall. The leaves on a lime tree are oval, dark green on top and lighter underneath. Leaves are 2 to 3 inches long. The blossoms are white and could have a purple tint. The fruits range from 1 to 2 inches wide. Pour 3 gallons of hot water into a 5-gallon bucket. Stir in 3 pounds of table salt until completely dissolved. Add 10 pounds of builder’s lime slowly, stirring constantly to combine the mixture well. Apply the mixture to tree trunks with a paintbrush. Allow to dry thoroughly, and add a second coat. Trim your lime tree before any blossoms begin to bloom. The best time to prune a lime tree is in early spring before blooms have appeared, or late summer, after all limes have fallen from the tree. A lime tree should be pruned once or twice a year at the most, although pruning a lime tree at all is not absolutely necessary. Wear gardening gloves while pruning. Although lime trees do not have stickers or thorns, broken branches can be rough and sharp. To avoid scrapes and scratches on your hands, wear gloves at all times. Enlist a partner to hold your ladder while you trim the difficult-to-reach areas of the tree. Trim away any dead branches with pruning shears. You can purchase pruning shears at your local home improvement store or gardening supply store. Trim the least amount of the branch possible in order to salvage the healthy portions of the tree. Trim crisscrossed branches at the center of the tree to allow more light to pass through. Branches that twist around each other will prevent new, healthy growth from forming out of either branch. Trim one branch away so the other can grow separately. Remove any dead clippings from the base of the tree to encourage further growth and water absorption. The clippings can be chopped and mixed into mulch to fertilize the bottom of the tree, or discarded. Allow 1/4 lb of key lime leaves to dry in a sunny windowsill for a day. Grind the leaves thoroughly with a mortar and pestle. They don't have to be powdered. Dump the crushed leaves into a muslin tea bag or a metal tea steeper. Place the bag or steeper into a coffee cup and pour near-boiling water over it. Allow it to steep for three minutes. Add honey and heavy cream to create a creamy lime tea. Add a pinch of mint for an optional kick. Place 1 cup of fresh key lime leaves in a food processor. Add approximately 1/4 tablespoon of orange juice, 2 cloves of garlic and a sprig of parsley to the food processor. Chop the ingredients thoroughly in the processor until it forms a green paste. Rub the paste over a meat such as pork, chicken or fish. Grill or broil the meat until it is done. The key lime leaves add a zesty and sweet flavor to the cooked meat, and it doesn't have to be scraped off. Pick a day of the week, such as each Sunday, to water your lemon or lime tree. Citrus trees thrive with consistent, once-a-week hydration. Water indoor trees with 1/4 to 1/2 gallon of water. Remove any standing water that collects underneath the tray the tree container sits on. Hydrate your in-the-ground and outdoor-container trees deeply. Use a moisture meter to test for the amount of moisture near the root area to know when you have watered sufficiently. Watch for leaves that start to wilt and/or turn yellow. Water immediately and wait 24 hours to see if the foliage perks up. If not, the lemon or lime tree is being watered too much; hydrate your citrus less frequently. Clean your tools before pruning your lime tree by mixing a solution containing 1 part bleach and 9 parts water in a mixing bucket with measurements written on one wall of the bucket interior. Soak a clean cloth in the mixture, and wipe the blades of your pruning tools with this cloth. Prune lime trees at any point during the year. If the trees are bearing fruit, remove all fruit before pruning the tree. Remove limbs that are dead, diseased or damaged by cutting them back to healthy wood at a point just above a leaf. Do not leave an exposed wood stub. Remove the weaker limb of two limbs that rub or cross one another. Shorten limbs that have weak growth by one-third, cutting them back to stronger growth at a point just above a leaf. Remove suckers, which are new branches that grow from the base of the tree's trunk. Suckers will steal energy from a tree and weaken it. Cut back each branch back halfway on trees that are no longer producing citrus in spring or summer. This renewal pruning produces a new flush of growth which can be damaged if you renewal prune the tree in fall or winter. Decide on the precise day for pruning the lime tree. It is tremendously important to prune each lime tree at the proper time each year. You should do this previous to the blooms emerging on the tree. This specific day can be any time from January through March (depending on the location). Examine your lime tree carefully. Search for any unhealthy or dead branches; inspect the lower area of the trunk for suckers; inspect every one of the branches to spot any that cross through the center of the tree. Make certain every one of your cutting tools is very sharp. If not, you should sharpen each one before beginning to prune your lime tree. 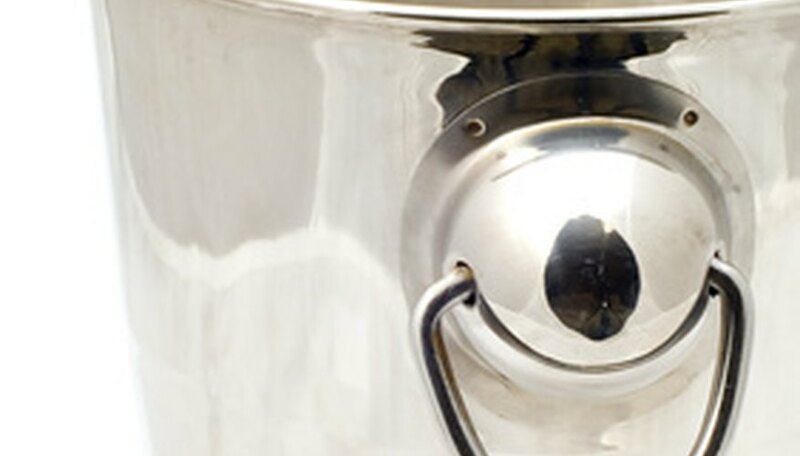 Use rubbing alcohol on the equipment to sterilize it. Collect all of your pruning tools in one place. Prune your lime tree correctly. Get rid of all suckers that may be budding from the lime tree. Remove any branches extending across the core of the tree. This will allow the tree to get more sunlight and improved air circulation. Eliminate all frail or diseased branches. Employ your pruning shears for most branches, and only utilize a pruning saw for the larger branches. At the same time as you are doing this, always observe the complete lime tree form. If your lime tree needs a great amount of pruning, you should not do it all in the same year. It would be better to do a little this year and then wait until the next season to do more. Lime trees only grow outside in the tropical and subtropical areas of the United States, in USDA hardiness zones 9 and 10. If you live in another area, grow your lime tree in a container indoors. Limes trees prefer soil that is sandy and well drained. Organic matter is not required in the planting site. Lime trees prefer full sun when planted outdoors. Place container-grown trees in an area with as much light as possible. During a frost, cover your lime tree with a blanket and place a 60-watt light under it. Bring container trees indoors. Apply a high-quality citrus fertilizer around the entire tree line three to four times per year. Water a newly planted lime tree every few days. Water an established lime tree every seven to ten days for best fruit production. Water a container-grown lime tree when the soil feels dry. Collect soil samples from several locations around the lawn area. Mix the soil samples. Allow the soil to dry. Deliver the final soil sample to your local agricultural extension service for analysis. Mix the pelletized limestone and lawn fertilizer together in the 5-gallon bucket. Follow the ratios for the application rate based upon the soil test results. Fill the drop spreader from the 5-gallon bucket. Set the drop spreader according to the soil test results for application rate. Run the drop spreader over the lawn in a single direction. Do not overlap the lime and fertilizer application, as this will burn the grass. 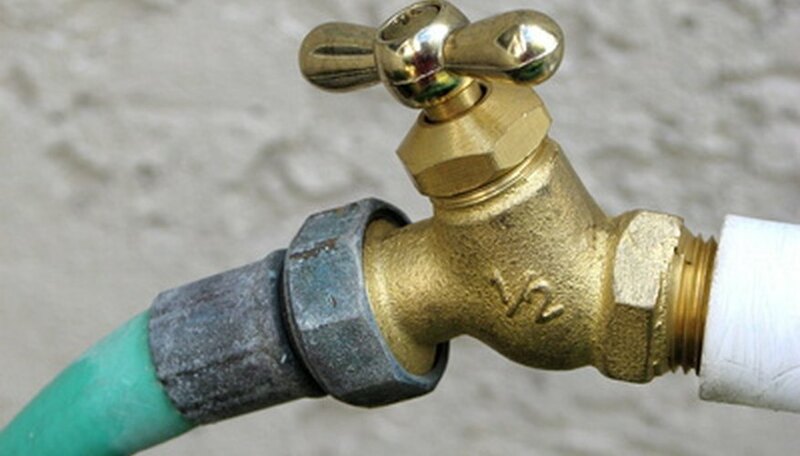 Irrigate the materials immediately into the soil. Fill the planting pot with seed starting mix, to within 1/2 inch of the top of the pot. Saturate the soil with water and allow the pot to drain completely. Push the key lime seed 1/4 inch into the soil and cover it lightly with soil. Do not press down on the soil covering the seed. Place the pot on the heat mat, set to 75 degrees F. and then place it in a sunny area. Keep the soil moist while the seed germinates, which should occur within two to three weeks. Turn off the heat mat at that time, and allow the lime seedling to remain in a sunny location. Repot your lime seedling into a 8-inch pot when it reaches 4 inches tall. Use equal parts of sand and potting soil and place the roots at the same depth at which they were in the smaller pot. Allow the top inch of soil to dry between waterings. 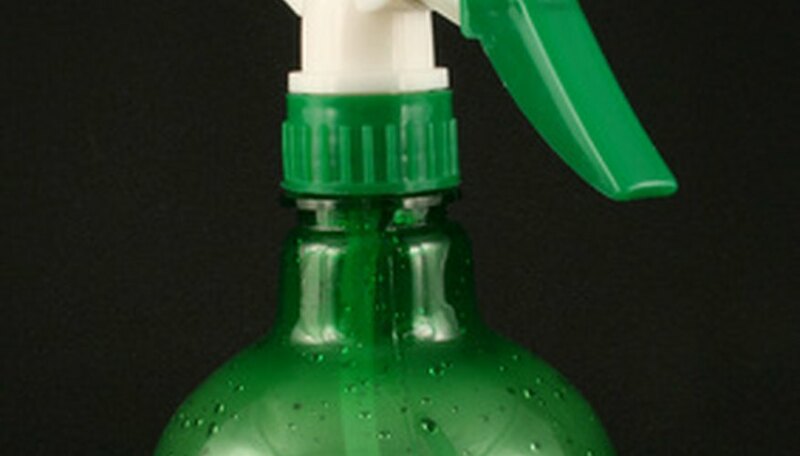 Fill the spray bottle with white distilled vinegar. Spray the white distilled vinegar on the lime deposits on the clay pot. Scrub the deposits with the wire brush. Scrub inside any designs or etchings. Fill a mop bucket 1/3 full of white distilled vinegar. Add water until the bucket is 2/3 full of liquid. Place the pot inside the bucket. Let the pot soak for two to three hours. Remove the pot from the mop bucket. Scrub off any stuck-on deposits.